The idea from the start was a game that blurred the lines between how games looked on console and PC. id Software's most famous games, actually all of its major games, were titles built on the computer first, then brought to consoles later. But not with Rage. id Software's big genre-blending shooter was created using the company's new id Tech 5 technology, an engine designed to run across all platforms, console or PC, with the same assets. But somehow the end result wasn't just a game that looked worse on one platform, it was a game that, at least for some, looked worse on the one platform id had for so long embraced: The computer. The chief issue with the current state of Rage on the computer, id says, is mostly one caused by the drivers that help the game interface with graphics cards made by Nvidia and ATI, something very frustrating for the perfectionists at id. 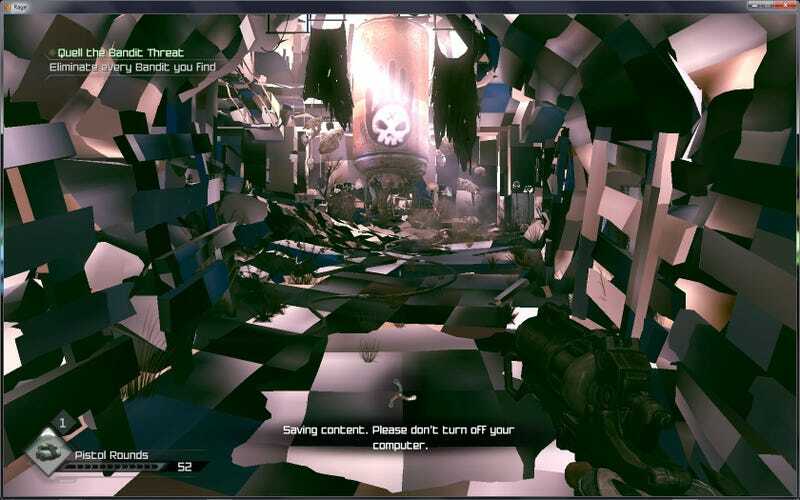 While Rage was built on technology meant to make the game the same on all platforms, it was still built using computer. Specifically, Rage creative director Tim Willits, told me the studio's internal development tools run on 64-bit PC systems, but when the game is submitted to the "build system," all platforms are created. That's when the game is tested, rigorously. "This system has led to incredibly solid and bug-free 360 and PS3 versions," Willits said. "Unfortunately, we have had video driver issues that have caused problems and frustrations with our PC fans. Everyone at id Software is very upset by these issues which are mostly out of our control. We are working with both AMD/ATI and Nvidia to help them identify and fix the issues with their drivers. We've had assurances that these problems are being addressed and new drivers will be available soon." The issues were so severe that it drove the normally soft-spoken Carmack to cuss. Well, nearly cuss. In a response to Kotaku about the launch problems, Carmack censored himself, but the anger was still there. "The driver issues at launch have been a real cluster ! @#$," he wrote. "We were quite happy with the performance improvements that we had made on AMD hardware in the months before launch; we had made significant internal changes to cater to what AMD engineers said would allow the highest performance with their driver and hardware architectures, and we went back and forth with custom extensions and driver versions." "We knew that all older AMD drivers, and some Nvidia drivers would have problems with the game, but we were running well in-house on all of our test systems. When launch day came around and the wrong driver got released, half of our PC customers got a product that basically didn't work. The fact that the working driver has incompatibilities with other titles doesn't help either. Issues with older / lower end /exotic setups are to be expected on a PC release, but we were not happy with the experience on what should be prime platforms." A question of prime platforms elicited another surprising response from Carmack, one he says he knows won't make people happy. I've noticed that among those people who aren't enjoying the PC experience, I wrote to the developers, the underlying issue seems to be one driven by expectations. People seemed to have been hoping that this would be a game that proved the value of owning a PC over a console. But instead they got a game that they feel cut some corners to level the experience between console and PC. Do you think that is a fair assessment? Does id still see the PC as the leading platform to make games for? "You can choose to design a game around the specs of a high-end PC and make console versions that fail to hit the design point, or design around the specs of the consoles and have a high-end PC provide incremental quality improvements," Carmack replied. "We chose the latter." The fact that id had already decided that they wanted Rage to run at 60 frames per second already removed one of the major things PC gamers look for in a title, he continued. That only left resolution, anti-aliasing, and texture streaming as things that a computer gamer might want to see look better than on a console. "We do not see the PC as the leading platform for games," Carmack added. "That statement will enrage some people, but it is hard to characterize it otherwise; both console versions will have larger audiences than the PC version. A high end PC is nearly 10 times as powerful as a console, and we could unquestionably provide a better experience if we chose that as our design point and we were able to expend the same amount of resources on it. Nowadays most of the quality of a game comes from the development effort put into it, not the technology it runs on. A game built with a tenth the resources on a platform 10 times as powerful would be an inferior product in almost all cases." Your Cable Box Is Dying. Long Live the Game Console! Your cable box is headed for obsolescence. It's like clockwork; Moments after popping open any game that has a mature rating, my 10-year-old son seems to appear at my elbow to ask if he can play it with me.